I’ve always been partial to 1969 Ford pickups. My dad bought one from Rufus Prayor when it was a couple of years old. 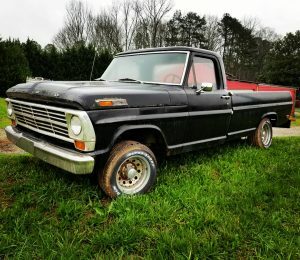 When he got a newer truck, I took over the ’69 and drove it until we hit one of the rough financial stretches that young couples often encounter. During that time, Joanne sold that truck, deciding that groceries were a higher priority than a sentimental old truck. So when I got a chance to acquire another one, I went for it. Having a truck that had been in the Davis family makes it special for me. I didn’t know Brett that well, other than having sat next to him on the back row at church a few times in his latter years. I know his brother Bart better, and but I knew their dad Jerry the best. We went to a lot of equipment auctions back in the day, baled some hay together and worked cows a few times. The Davis family members are die-hard Blue Oval folks. I asked Bart for the particulars, and he filled me in. Jerry worked at the Ford Assembly Plant in Hapeville for 16 years, then in 1969 (an appropriate year for this story) he went to work for his brother Edward at his dealership in Fayetteville, the one that is now Allan Vigil Ford. He stayed there until Edward sold the dealership in 1981, and he and Gene Horton ran a used car lot just up Ga. 85 from the Ford dealership until 1986, when Jerry was diagnosed with a brain tumor that eventually took his life. Jerry’s wife Harriett worked in the Ford parts division in East Point for 30 years. Bart worked there too for 19 years and his wife Denise for 16. And another uncle, Dean, had a Ford dealership in Barnesville for 30 years. When I got the truck, it was suffering from the typical issues that come from sitting for years. The ethanol blend gasoline had turned the gas tank into a tub of black goo. The fuel pump was shot, and the carburetor was gummed up, all due to that bad gas. The alternator wasn’t charging, and after I bought a new alternator and regulator I found that a bad wire was the problem all along. Even after all that, the truck wouldn’t idle right when it warmed up. I consulted Chester Plunkett, who is a pretty sharp Ford engine man too and worked for years in the parts department at Davis Ford in Fayetteville. The truck has a three-speed manual transmission with overdrive. I finally got the overdrive linkage freed up, and it works too. Roscoe told me that those overdrive units have a separate oil reserve in the transmission and letting that get dry is what usually ruins them. I checked mine, and it was way low, so score another one for Roscoe. I’ve still got a few things to do to the truck. The tires are kind of tired, and the fluids need changing, but it’s back on the road again. Maybe Joanne won’t ever have to sell this one.